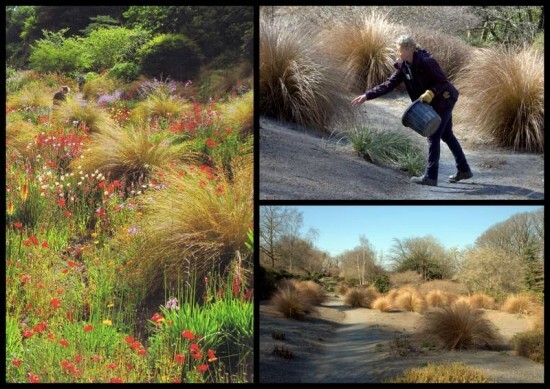 The South African Garden is delightfully optimistic, given that it exists on a north-facing slope, and receives 60″/ 150cm rain each year. When I visited it was rather barren, consisting only of New Zealand Sedge, Chionochloa rubra. Planted in sufficient numbers to feel gutsy, it doesn’t matter that the gritty paths are, at present, visually dominant. A picture in the guide showed what delights are to come, and in fact they were sowing the mix of Field and Californian Poppies, (Papaver rhoeas and Eschscholzia californica) the day I was there. Interestingly this garden used to have a much more diverse planting, but successive winters with temperatures falling below -8 deg C meant they lost most of the South African perennials. However, judging from the brochure, simplicity works well enough, and this minimal planting would be a good one to try if you want to achieve a hot garden effect in a colder area. The Magic Circle was part of the expansion of the garden, almost 20 years ago and is a lovely little area, with a calm, almost spiritual feel. The stones themselves are locally sourced granite, and form the end of one of the main garden vistas, from the house along The Long Walk. From a distance however, they are rather overshadowed by an striking group of Betula ermanii ‘Grayswood Hill’, just house-side of the circle, which is roped off to protect the colony of fly agaric toadstools that pop up amongst the fallen leaves each autumn. 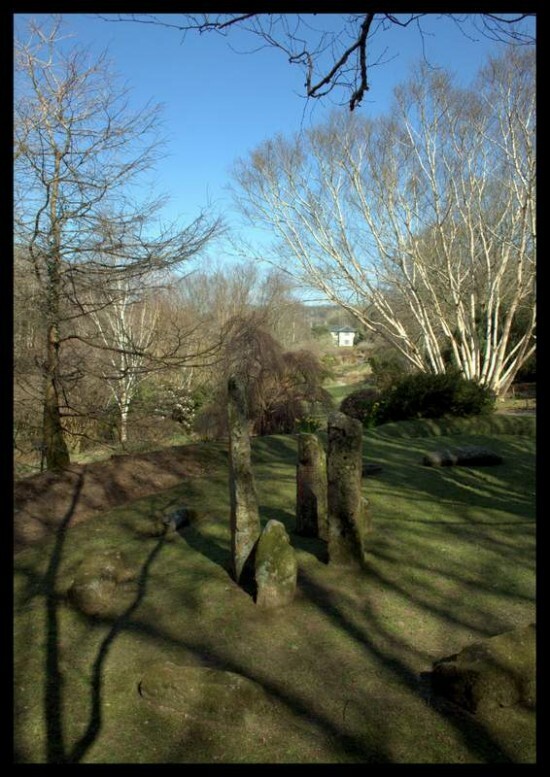 Inside the circle, looking back towards the house, the birch trunks splay out rather like a see through curtain, giving the whole area a secluded feel, whilst the stones themselves are centre of attention. The Acer Glade wasn’t yet at it’s best, but even with bare twigs it has a sense of movement. The prostrate varieties of acer provide interesting ‘hummocky’ shapes moving down the hillside, and the trickling rill is a simple, yet effective link from top to bottom. I worry that I would find it all a bit too much once the leaves are colouring in autumn: I do hope there won’t be too much foliage colour contrast, as it is rather lovely in it’s stripped back state. Most exciting is the combination of prostrate acers with mounds of rusty-coloured grasses — more of the New Zealand Sedge, Chionochloa rubra I think. I would be interested to see how this develops though the season. I had missed most of the bulbs, but according to the guide, this area boasts tens of thousands of crocus, followed by native wood anemone earlier in the season. The Bulb Meadow is very charming, although I found some of the planting at the top, bordering the main path a little distracting; the fir trees, and more formal shrubs didn’t seem to work with the ‘naturalistic woodland glade’ further down the slope. However, I imagine that these will come into their own later in the season, and it’s never fair to judge a garden in one season alone. I wouldn’t dream of doing so in a smaller garden, and guess I am just getting carried away with the size of space they have to play with: Presumably it would be disappointing to the visitor if an individual area had absolutely nothing to offer during the main months of the summer, whereas in a private garden of this size you could possibly get away with it. 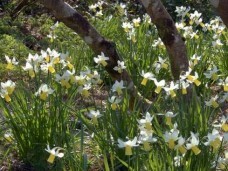 Elsewhere however this area truly sparkled — literally, as the early morning sun picked up the golden reflexed petals of Narcissus Cyclamineus. I have never seen a more beautiful setting for these, as they seemed to dance in and around the various stone structures; a simple cairn-like mound being the main focal point. This was enhanced by sweeping curved lines of stones, simply buried in the soil. 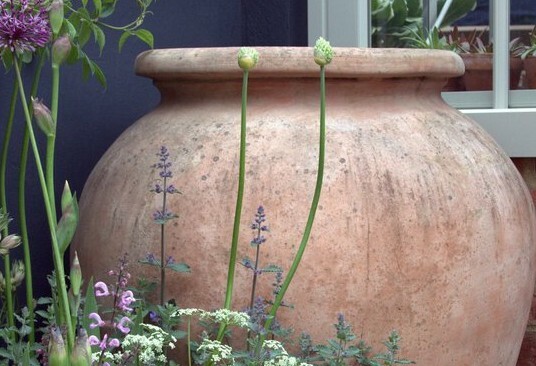 Another idea to steal from The Garden House: create a focal point, and then cheaply and easily magnify both it’s literal size and visual importance by some kind of ‘feathering outward’, using hard materials, but with gaps between. In fact, the same technique was used in The Magic Circle, with half-buried stones forming curves sweeping around the standing stones. 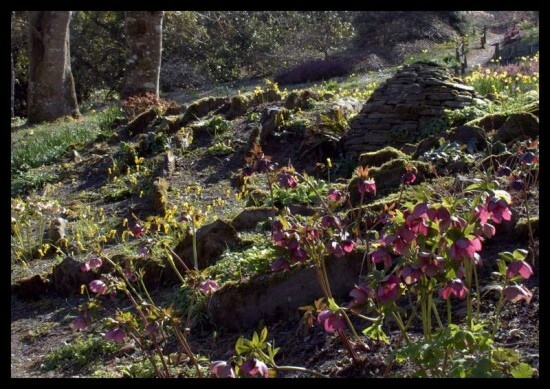 I would love to come back (usually April) for what the brochure describes as ‘one of the finest colonies in the country of Erythronium revolutum, carpeting the ground under the boughs of a magnificent Magnolia x loebneri Merrill‘.